Mary was devoted to her loving husband, kids and entire family. She would often greet others with a kiss. Her laugh was very contagious. She loved having a good time with her grandkids. Mary loved making quilts, sewing clothes, working in her flowerbeds, taking pictures, and drawing. Mary loved to cook, especially for her family. Her tacos were the best! Wherever she was, a Dr. Pepper would be close by. Mary loved to go shopping and shop for others. She never had enough clothes or shoes! Mary loved her cats and at different times had more than could be counted. Mary was a woman that cared greatly for others and opened up her home on many occasions to help. Her love for others was unconditional. Survivors include her loving husband, Carlton Murry; her son, Tony Murry and wife Cathy; her daughters, Amber Sissiom and husband Todd, Carla Cade and husband Josh; her grandchildren, Erica Potts and husband Kiah, Michael Murry and wife Malynda, Trenton Sissom and Noah Sissom, Kaman Wright and Kylin Cade; great grandchildren, Chloe, Kache, Kase, and Krew Potts and Addilyn Murry. 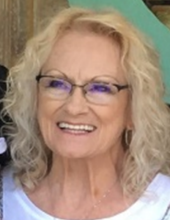 Visitation will be held on Sunday, April 14, 2019 from 5:00-7:00 PM at Autry’s Carroll-Lehr Funeral Home. Funeral service will be on Monday, April 15, 2019 at 2:00 PM at the First Baptist Church of Murchsion. Burial to follow at Red Hill Cemetery. "Email Address" would like to share the life celebration of Mary Frances Murry. Click on the "link" to go to share a favorite memory or leave a condolence message for the family.